I was extremely humbled when recently contacted by AbilityPath.org advising me that I had been selected as one of their “Rad Dad’s.” During our interview I had a great time talking about the joys of being a dad, including some of the unique characteristics of being a father of a son born with Down syndrome. I want to add that I’m just one of the many dads out there who are totally in love with their family. To all of you other dads (and mommies) who are out there rocking it, thank you so much for all of your hard work! It’s been an honor meeting so many incredible parents through this site, and our Facebook page. If you haven’t checked out AbilityPath.org you should. They are committed to helping parents and their families, and that’s something I’m all about! I’ll let you check out their site on your own, but here’s a little sneak peak from their about page. AbilityPath.org’s mission is to build a community that brings together professionals and parents of children with special needs from around the globe to learn, share and strengthen the process of supporting the ongoing healthy development of children and youth with special needs and disabilities. I enjoy supporting and promoting organizations like these, and I encourage you to check them out on Twitter and Facebook as well. One thing I really love about families is that every parent has the potential to become a game changing parent. Sadly, many don’t believe they are, or have the potential to be. But they do! Other parents think the school, the church, or the grandparents should function as their child’s game changing parent. The truth is all of those are poor substitutes for a parent. If you’re a parent you have the ability to be the best parent in the world for your child! I’m no parenting expert, but I wanted to share a few things I’ve learned to help you become a game changing parent. 1. There Are No Time Machines. Being a “Rad Dad” is a passion of mine…and not just the ‘Rad Dad” of the month on AbilityPath.org. I’m talking about the minute to minute, day to day, ins and outs of parenthood. I love it. In fact I’ve given my entire life to supporting, encouraging, and loving on families. Now this doesn’t mean I’m a perfect parent by any means, but but it does mean that next to my relationship with God, my relationship with my family takes priority. It means that I try to be very intentional about my son knowing every day how much I love him, how proud I am of him, and how much God loves him and has a great purpose for his life. It breaks my heart when I hear the countless sorties of dads who aren’t being dads. Dads who walked out on their families. Dads who couldn’t handle raising a child with special needs (Give me a break.) Dads who haven’t spoken to their children (or the wives) in years. Dads who enjoy hanging with the guys, more than growing, developing, loving on and raising their children. And the list goes on and on. I don’t think these fathers realize the impact their current actions have on their future children. I don’t think these fathers understand that the greatest influence (either positive or negative) in a child’s life is their parents. I don’t think these fathers know they have the potential of being a Rad Dad themselves. Like I said, being a “Rad Dad,” a dad that is pouring into his wife and children, isn’t a one time thing. It’s not a monthly “winner.” It’s a lifestyle. It’s something you work on every day of your life. Somedays you you fail. Somedays you win. But you keep working on it. Everyday. 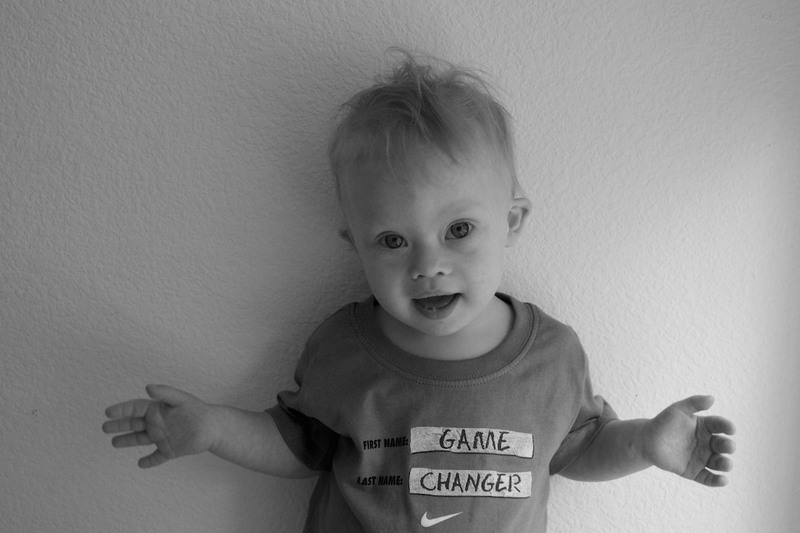 But the point is you are committed to being a game changing dad! 2. Don’t Get Fooled By Facebook. We live in a world where (real) transparency is almost non existent. We have Facebook, where at any time we can jump on our newsfeed to see countless pictures of all the fun (and expensive) vacations our friends are on. See more pictures of all the great meals they always seem to be eating. And read an endless supply of status updates about all the fun stuff their doing…and you aren’t. Oh and let’s not forget all the nice cars and toys they always seem to be buying (and posting pictures of.) It almost looks like everyone has a more fun, active, and happy life than you. I’ll let you in on a little secret. Often times I take 20, 30, 50, pictures to get that one good one that you saw on Facebook. I just don’t post the bad ones. So for every one good picture you see, there’s 50 more you’ll never see, because they weren’t any good. So the truth is I don’t think great pictures, I take bad ones. Lots of them. You just don’t see them. 3. Nobody (and no family) is perfect. Never forget this. You know why? Because that’s mostly what I share. I’m not going to post a video of the argument my wife and I got into on the way home from church one day. I’m not going to post a picture of the time Noah threw up all over me (several times.) In fact, this weekend I’m doing some yard work, but you’ll never see any pictures and videos of it. It’s just boring, typical, run of the mill stuff. Nothing exciting about it. Don’t get me wrong, I try to be transparent about our life. In fact I’ve shared lots of posts on this blog about fear, worry, and the whole nine yards. But my wife and I will be the first to admit we are far from perfect parents. We mess up. We don’t do everything the physical therapist tells us to do with Noah. (Shhhhhh, don’t tell her though.) We let Noah watch tv. We’ve given Noah fast food. (It was however In-N-Out burger which is so good I’m not 100% sure you can really call it fast food.) 🙂 We get into arguments from time to time. We are just your typical family trying hard to love God, our family, and others the best way we can. Some days we do an ok job at this, other days…not so much. But the last thing we ever want anyone to think is that we have it all together, or somehow know more than anyone else out there. We don’t. Not by a long shot. We value all of your comments on the blog and on Facebook, and read every single one of them. You guys teach us so much, and it’s so wonderful to be on this parenting journey with so many game changing parents! God isn’t interested in perfect. He knows there is only One Perfect Person whose ever lived…and it isn’t you! I just want to encourage you today, that no matter how things have been in the life of your family, let today be a new start. Let today be the day you start giving your children the gifts they really want. There are no perfect families. They don’t exist. Every family is in in process. Let’s throw away the stock images of families that seem to have it all together. Let’s stop pretending we’re something we’re not. Let today be a game changing day in the life of your family. Let today be the today every thing changes. Sometimes to be a game changing parent all you need to do is simply have fun with your kids. It doesn’t need to cost any money. Sometimes it is simply encouraging your pre-teen kids and their friend to ride in the cart at the grocery store while you pile groceries on them, just to be silly. Or you jump in the cart and let the kids push you around the store. It creates a lot of laughter and memorable moments. The moments our kids remember the most usually don’t cost any money. It is the little things that matter. It sounds like your an awesome mom! How many children do you have, and what are their ages? This was great. Thanks for writing and posting it! I just wanted to thank you for encouraging fathers out there to stick with it and remember what a big impacted they have on their children. Men are not as strong as women are in handling stressful situations for their children, so when the dad can stick with it and be there for that child, it makes the family all that more able to handle any thing that comes along for the disabled child. Don’t get me wrong about single families, they can get the job done too. I think being a game changer is to trust your instincts. If you feel it in your gut or where ever, than do what you think is right for your child. Don’t always listen to that doctor or teacher or whom ever is involved with your kid. They are not always right and don’t always do right for your kid. They are NOT God. You know your child best and there is nothing in the world you want most is to have every thing right for them!! So trust your instincts!!! You know its right. My favorite dad cop out is the one where they play dumb to get out of taking care of the kids. They act like they can’t change a diaper, or hold a crying baby, or give them a bottle the “right way”. So they convince their wives they are incompetent so they never get stuck with any responsibility. Meanwhile their wives feel trapped and alone in raising their small child. This is only more pronounced with a special-needs child. At the end of the day, these men are too selfish to get their hands a little dirty. Nice post Rick. I believe in you buddy. Noah looks so big!! He is an awesome little fellow and so are his mummy and daddy! this is amazing .i love the blog .it must take lot of work just to make it work . actually my sister was born with down syndrome a few months ago .we were really worried .but now at least we feel a bet relieved because of this amazing kid noah and seeing him develop infront of us is just amazing !! Thanks for an excellent post. 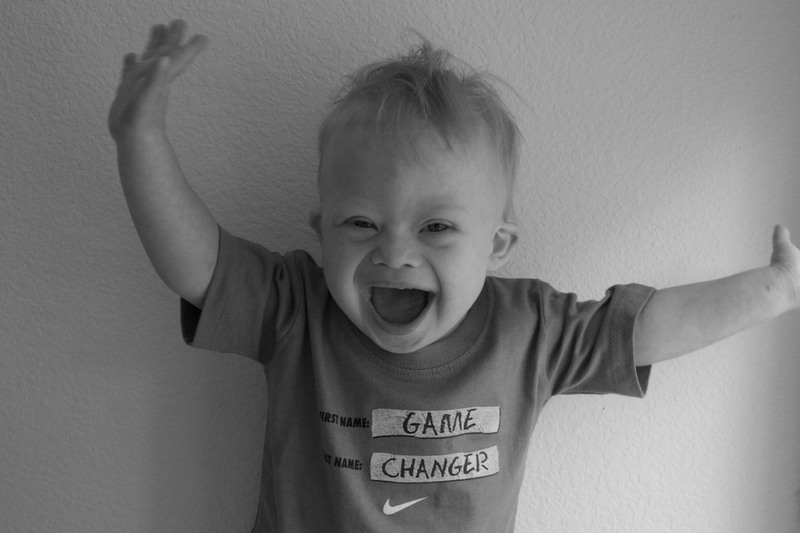 Our family has faced several challenges over the last few years, not limited to raising a child with Down Syndrome. Sometimes it’s difficult for me not to feel envious of other families that lead seemingly charmed lives (or at least seem to live easier lives than we do). I try to focus on the positive (and my daughter is at the top of the list! ), but there are days when I feel overwhelmed and think “Why me?” As you note, however, we all have our issues and there are certainly parents who face even bigger problems that I do; any visit to your local children’s hospital will attest to that. So I thank God my child is relatively healthy and learning new things every day. Blessings to her and to Noah!! This post really was a blessing to me. I’m so thankful people like you are honest, sharing about the Lord (not hiding your faith) and encouraging others! Really, with all the negative sinful stuff out there, this post is a BRIGHT LIGHT in the darkness. Thank you and I am praying for your family and all those you will reach with a much needed message! Thank you for being so honest about parenting. Being an educator I know that intentional instruction is so important. At times I get frustrated with myself in that I may not be as intentional with my son as I should be. We are at a place in our life that we can breath easily; he suffered from a heart condition from birth until he was able to have his surgery at 6 months. In fact this time last year we were recovering from his open heart surgery. Now Marcos is a busy 18 month old that keeps us laughing. I credit my husband for being such a hands on dad. He never hesitates in any aspect of parenting-our game has changed for the better! Hi! It’s Ty & Tracy! I really appreciate the message behind this post…there are so many parents out there who think their job as a parent ends once they drop their kids off at school, or at practice, or wherever. I’m not advocating for helicopter parents, mind you, I’m simply saying be involved in your kids lives, *all* of your kids lives, regardless of their abilities. With that being said, my game changing parent tip would be to BELIEVE IN & BE INVOLVED with your kids 24/7, not just when they’re at home in your direct care. Someone asked me years ago, when Ty was itty-bitty; (he’s almost 10 now) “if you aren’t Ty’s advocate, then who is?” You signed up for this crazy ride called parenting…so hop on! It’s full of twists & turns, but all worth it. Thanks for sharing this. I’m sorry to hear your sons child hasn’t been involved in his life. That is super tough. It sounds like there is someone in your guys life who is stepping in be a “father” to your son. That is great. It may not be the same, but it will still be great for your son. this journey alone. There are tons of families (us includes)here with you to support you any way they can. I’m not sure if you are on our facebook page (http://Facebook.com/) but there are lots of great families there. And we all enjoy pictures, so feel free to post one (or several) pictures of your son. There are two words that encapsulate the best parenting advice I’ve received over the years: be intentional. If there are qualities you want your children to possess, be intentional about modeling and teaching those things. The truth is, we don’t always FEEL like doing the things we need to do as parents. Doing it anyway is what matters! What helped me take a deep breath and exhale was one simple thing I told myself. 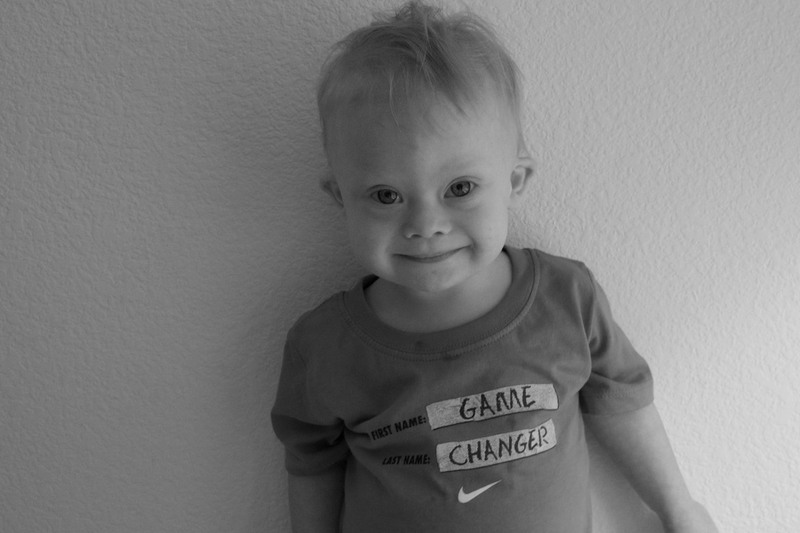 ” this is my child not a diagnoses “. After that I was able to do everything we needed to do for our son. He will be 5 years old on Feb 16. He is truly our little T21 angel. Love that! What great advice. Thanks so much for leaving a comment. Do you guys have any other children? Thank you so much for this post. Sometime i get so caught up in trying to be perfect and not damaging my kids that i forget to just have fun and enjoy them. God bless you and you family.